Sponsored by California Pizza Kitchen’s new Gluten-Free and Hand-Tossed Style Crust Oven-Ready Pizzas. 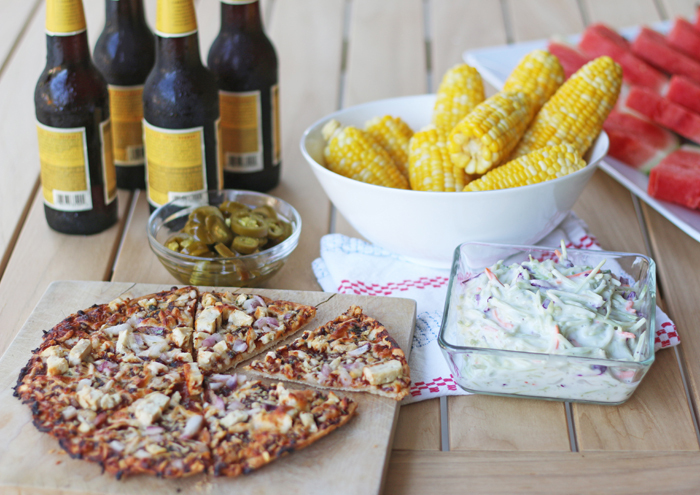 Summer entertaining doesn’t have to be all burgers and brats and working the grill. 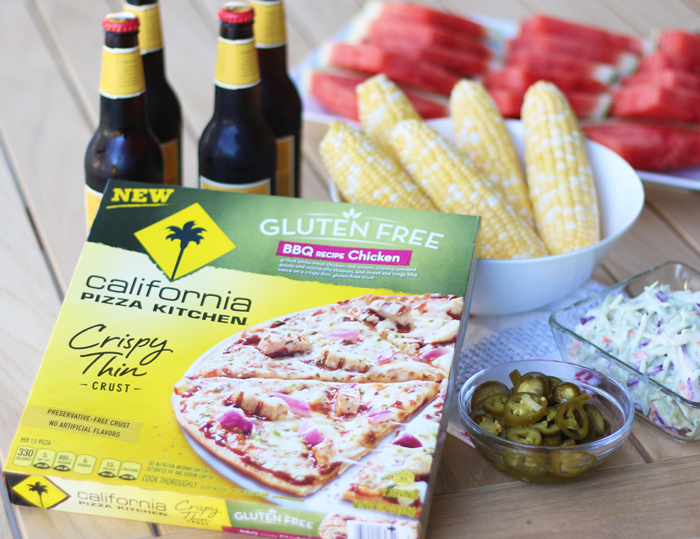 Bring California Pizza Kitchen’s new oven-ready Hand-Tossed Style and Gluten-Free Pizzas outdoors for your next pool party or backyard picnic. 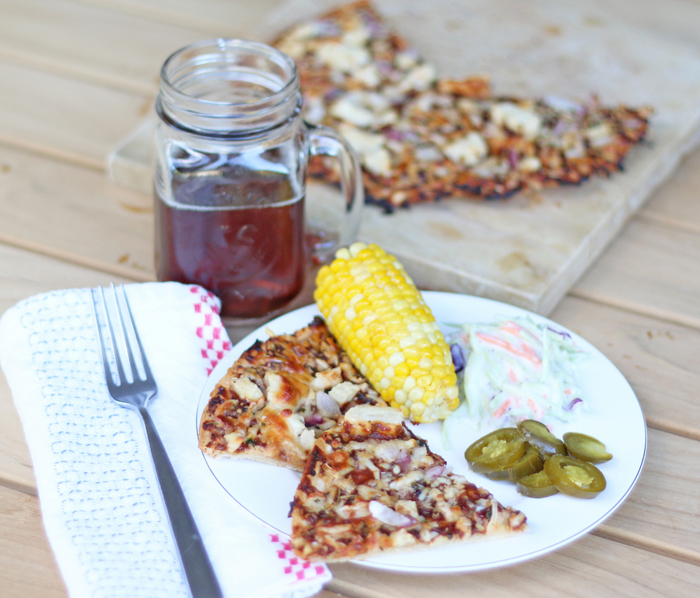 Pair BBQ Recipe Chicken Pizza with a side of coleslaw, fresh sweet corn and a local beer. 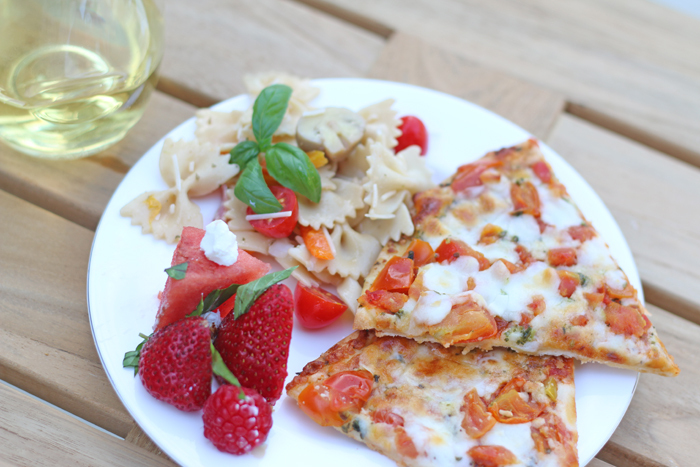 Pair Margherita Pizza with Italian pasta salad, fresh fruit with a balsamic drizzle, and a glass of Pinot Blanc. You and your guests will never miss the hotdogs after trying these delicious combos. 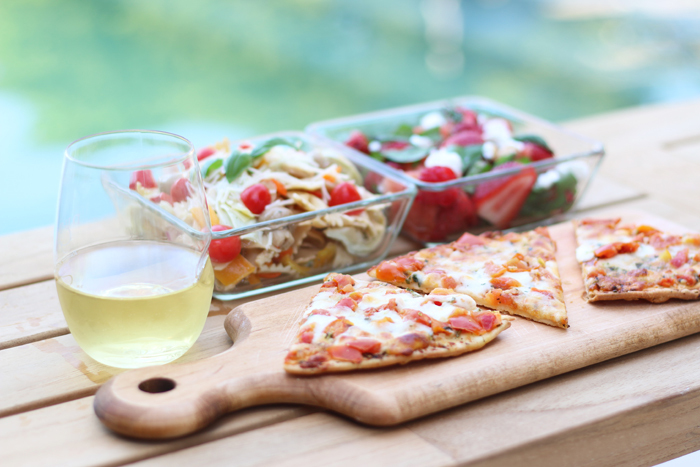 Read on for the low-down on how to prepare these simple and delicious Summer meals for everyone who makes you laugh. 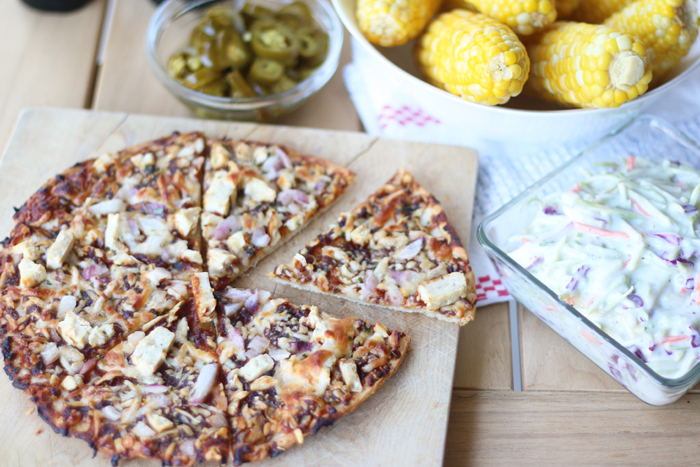 California Pizza Kitchen has recently created two new BBQ Chicken Pizza recipes, Gluten-Free BBQ Recipe Chicken Pizza with a Crispy Thin Crust and BBQ Recipe Chicken with Bacon with a Hand-Tossed Style Crust. Both options are just screaming to be paired with your family’s favorite BBQ sides. For our party we mixed up some broccoli slaw by combining shredded slaw mix with our favorite Slaw Dressing from the grocer’s refrigerator. We grilled corn and served up my own candied jalapeños. Add everyone’s Summer favorite, watermelon, and a variety of local beer and lemonade. It’s so exciting that a gluten free diet no longer means sacrificing convenience and great taste. This next meal is perfect if you’re looking for lighter fare on a Summer night and it’s so simple to prepare. 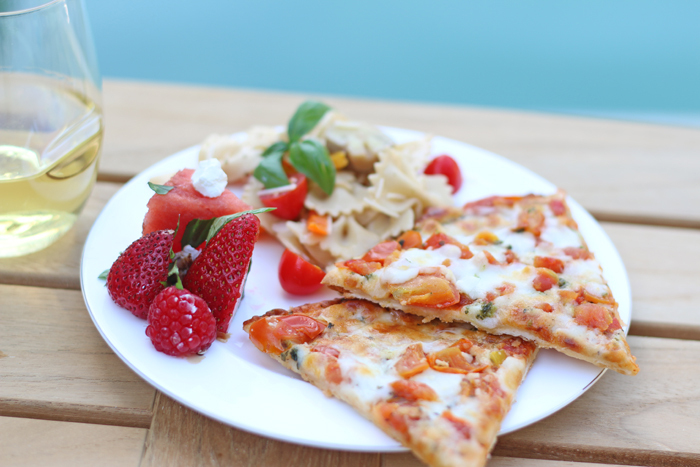 Feature California Pizza Kitchen’s Crispy Thin Crust Margherita Pizza, which also comes in a new Gluten-Free version, and is created with premium ingredients like vine-ripened tomatoes and sweet basil. 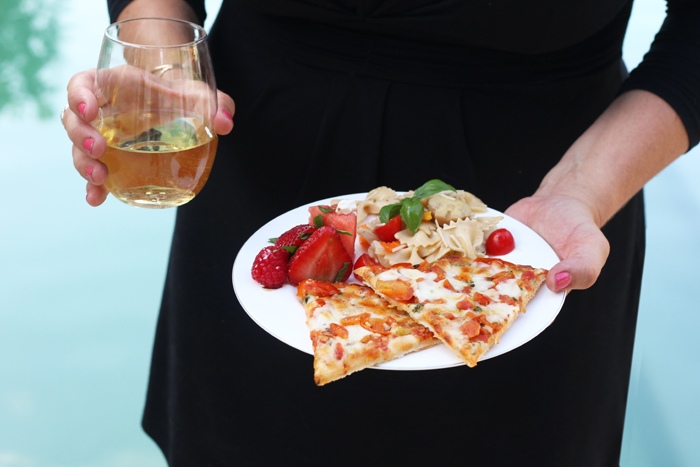 It’s a delicious main course for a casual, yet classy get-together. For this party I was inviting my book club over after work so I kept the menu fresh and tasty, inspired by Summer in Italy. First I made an easy pasta salad with cooked bow-tie pasta, balsamic vinaigrette, fresh yellow peppers, cherry tomatoes, black olives, marinated artichoke hearts and mushrooms and a bit of chopped salami. Basically anything delicious I had on hand. Add salt, pepper, fresh herbs and a sprinkle of shredded parmesan cheese. Our irresistible fruit salad is a mix or watermelon, strawberries and raspberries topped with bits of goat cheese, Italian basil and a drizzle of balsamic vinegar. 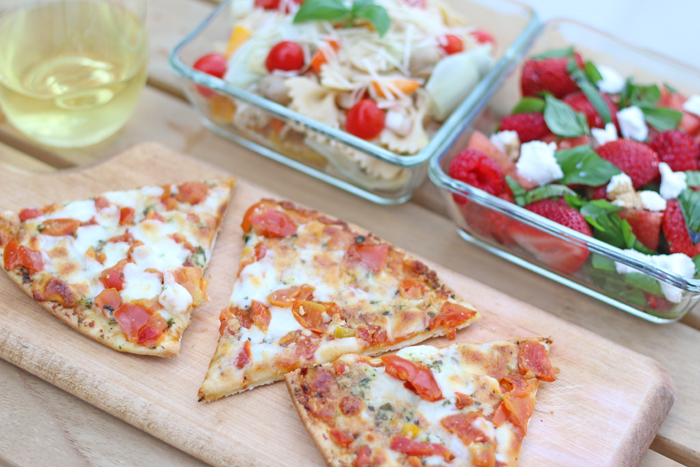 Add a glass of your favorite white wine or Italian soda. Are you inspired to invite a few friends over for Dinner? Between these two menus, there is something for everyone. All you need is a quick affordable stop at the grocery store and about 30 minutes total to prepare either one. Salud!